GENEVA, June 11 (Reuters) – The World Health Organisation is raising its pandemic alert to phase 6, the top level on its six-point scale, to indicate a flu pandemic is under way, WHO Director-General Dr Margaret Chan said on Thursday. “This means the world is moving into the early days of its first influenza pandemic in the 21st century,” Chan told reporters. Chan said the move reflected the geographic spread of the virus but did not indicate the severity of the influenza (A) H1N1 pandemic. She said the WHO’s global assessment was that the pandemic was moderate. Tighten up those seatbelts, folks. Our tourism-based economy is about to get even more turbulent. Every sovereign nation has the right to control its borders and to limit immigration to the number and types of people that are beneficial to the country. What is happening in Barbados now is not so much a debate on immigration as total shock that the Government of Barbados announced it would actually enforce the existing laws. Horrors! Imagine that… actually enforcing the Rule of Law in Barbados. No wonder people are upset! This immigration dust-up would not have happened without the current financial crunch, and similar debates are happening around the world in the “have” countries and in the region, Barbados is certainly a “have” country – even if it is all borrowed. What Rickey Singh’s article should remind us of is that this financial crisis will be over someday. Barbados does not want to be seen as a pushover nation, but neither do we want to be remembered as being viciously hostile to immigrants the moment the economy faltered. Listening to some of the comments on the ZR or published in the papers and on the web, I have to wonder about some folks who attend church on Saturday or Sunday and cuss out immigrants Monday to Friday like they are some sort of sub-human invaders. It is a small planet. Some folks would do well to remember that and treat their fellow travelers with a little more kindness. … submitted by a BFP reader. Some edits by Marcus. “A trip to Washington, DC, for the first ever annual Caribbean Tourism Summit last June cost the Cayman Islands’ Department and Ministry of Tourism nearly CI$200,000. And the Department of Tourism US sales meetings held in Miami in February cost $50,287. Barbados Tourism Ministry spent… OH… YOU HAVE NO RIGHT TO KNOW! Freedom of Information legislation (FOI) is no magic solution to stopping the kind of corruption and abuse recently pointed out by the Auditor General of Barbados, but it is a necessary first step in ensuring transparency and accountability by elected and appointed government officials. That is why successive Barbados governments, including the current DLP administration, have refused to pass Freedom of Information legislation. In the Cayman Islands government officials have three months to respond to a FOI freedom of information request — and they do so because there is rule of law. They may not always respond quickly or happily or completely as they should, but they respond because they know they must obey the law. As a result, the citizens of the Cayman Islands and their responsible news media have a basic tool to assist in keeping the politicians honest or discovering abuses. Barbados citizens were promised integrity, transparency (FOI) and accountability legislation (ITAL) by David Thompson and the DLP during the 2007 election campaign. The government of then Prime Minister Owen Arthur was defeated and David Thompson was elected largely on the basis of promised integrity and Freedom of Information legislation. Many Barbadians believe that the call for integrity and FOI legislation by the blogs was the tipping point that denied Prime Minister Owen Arthur a fourth term. And yet here we are almost 2 years later and it is still legal for Barbados government officials to award government contracts to themselves and their relatives. We have no Freedom of Information legislation. We have no Ministerial code of conduct or conflicts of interest laws. It is still legal in Barbados for government officials to accept gifts from government contractors and land developers who need permissions. The one thing David Thompson didn’t lie about is that fatted calf now being shared by DLP supporters. 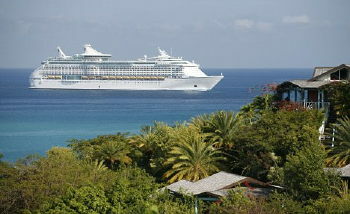 Things are the same in Barbados as they ever were. 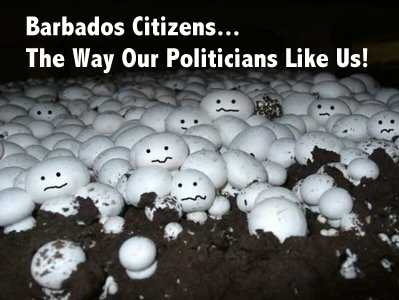 Until our politicians are shamed into adopting modern integrity, transparency and accountability laws, Barbadians and their news media will remain as they are: like mushrooms kept in the dark and fed horse manure. Thanks to an old friend for alerting us to this story.